When needy children plunge their hands into the Easter grass of brightly colored baskets to retrieve their goodies, the St. Vincent de Paul Society volunteers who packed them with love and prayers say they hope their delight will lead them to discover the greater gift given to them by Jesus at his resurrection. 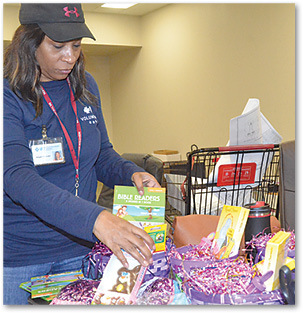 St. Vincent de Paul will distribute more than 3,200 Easter baskets this year, according to Desha Martin, SVDP volunteer coordinator. The baskets will be distributed to children in the East Baton Rouge Head Start Program and the Easter Bunny will distribute as well as to children at the SVDP dining room on April 13. While many think about giving at Christmas, Lent is a time of soul searching and reflection, said SVDP Executive Director Michael Acaldo. The Build a Basket project is an ecumenical project that helps people look beyond themselves by reaching out to people in need, according Acaldo. “At Easter, we celebrate the life and resurrection of our Lord, and there is no better time to give and to share the Easter message of hope,” Acaldo said. He said the Easter basket project is SVDP’s way to let children and their parents/guardians know that Easter Sunday is different from all other Sundays and that someone cares about them. Volunteers came to the Bon Carre Business Center and filled shopping carts with stuffed animals, candy – in the form of chocolate crosses or Easter bunnies, in plastic eggs or packages – as well as coloring books, crayons, toys and other items donated from around the diocese. The assembled Easter baskets also contained the story of Christ’s resurrection at Easter. The opportunity to tell others about Jesus’ resurrection was the calling card for volunteer Debra Averhart. Her grandchildren love to dye Easter eggs, which she hides for their egg hunt. But her main goal is to make sure the children discover the true meaning of Easter. “It’s all about the resurrection of our Lord Jesus Christ,” said Averhart. Yalan Tang has volunteered to wrap Christmas gifts for SVDP and enjoys seasonal projects. “I feel that when they open their basket they will be so happy. I want to share in the joy with the child. I love children and want them to feel special. I want to do all I can for them,” said Tang. 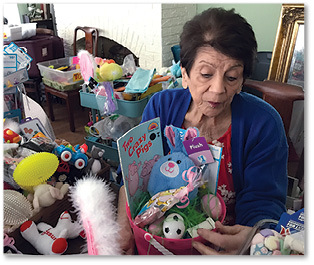 Working on Easter baskets was something Margarett Upshaw said she loved to do as a child. “Children should be able to celebrate Easter,” said Upshaw. He has enjoyed going in a different direction by joining in the Easter basket project for his Lenten journey and thinks about the gratitude that will fill the children’s parents and guardians’ hearts as they and their children receive a message of hope during their trials and sufferings. Del Rio was recently helping with the Easter baskets when a big truck backed up to deliver 330 Easter baskets assembled by Pat Hill at her home. Last year, Hill, the most pro-prolific Easter basket project volunteer, assembled over 1,000 baskets and hopes to match or exceed that number this year. Hill’s family also helps her develop a theme for each basket. Her church family, St. Thomas More Church in Baton Rouge, also helps by sending supplies or monetary donations. Hill said that sometimes a little gift, like an Easter basket, might be all it takes to help a child recognize that something good happened on Easter Sunday – Christ’s resurrection. “Hopefully they’ll grow up and look a little further into it,” she said and discover for themselves the true meaning of Easter.